At a mere £599 for what is a genuine American Fender, this has to be on most players' must-try lists! Wonderful Tele tones with extra warmth. Small construction issues aside, it's near faultless. Fender's Highway One series first appeared back in 2002. Four years on and the successful range - the entry point to the USA-made instruments - has been substantially upgraded in specification but not price: that stays the same. Originally conceived as an affordable players' guitar, Fender's Highway One upgrade concentrates on sound: "It's function over looks: performance," says Justin Norvell, Fender Electrics marketing manager. It's still a thin coating and there's no getting away from the fact that it's very likely to mark much more readily than a thick layer of high-gloss poly. But that's the point, Fender wants it to show the battle scars. A huge advantage is that the finish, tonally, will allow maximum resonance too. Another notable change is with the overall livery, which has changed from a fifties-style to an unashamedly seventies feel - black outlined gold Fender logos, parchment pickguards and 22 enormo-frets. Replacing the vintage-style single-coils are what Fender describes as Hot Strat and Tele single-coils that are all based around an Alnico III magnet foundation, a mid-strength magnet that should provide a slightly enhanced, hotter performance when compared to an Alnico II. The Tele's bridge plate bears a trio of chromed saddles and traditional thru-body stringing. The guitar features a single-piece neck of a lightly flecked maple. Niggles? Well, we did discover a shoddy point. When we removed the Tele's control plate during our investigation into the Greasebucket circuit we found that one of the screw holes securing the chrome had been drilled into the body twice. A conundrum with reviewing such iconic guitars is exactly what to plug into, let alone what to play, so we ultimately plumped for a Rivera Clubster 45 and set to work. The Tele is, as you'd expect, a 'zingy' proposition and with a similar gain setting it cuts like a knife… wholly musically, of course. It still amazes us just how versatile a Tele can be, and the Greasebucket simply adds more and more sounds to your fingertips. If the classic tone is just too bright for you, the tone pot is subsequently a far more capable tool to wield. 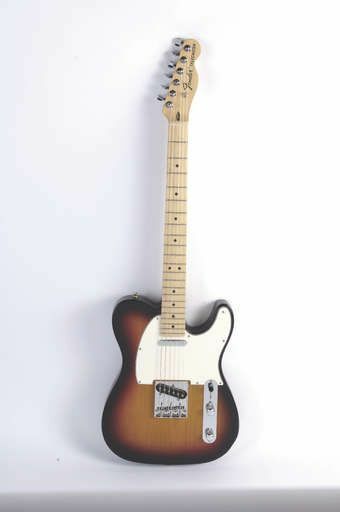 A Tele of a standard configuration will never be perfectly at home with extreme rock and metal styles but, for blues, country, pop and the rest it's ideally suited. The guitar features a modern 'C'-shape to its neck, although its fingerboard widens more expansively out towards the body, and those 22 jumbo frets - and they are big - have always been a more comfortable option to those spindly vintage wires. Aside from purely aesthetic changes like the logo font, most of these Highway One upgrades are all about sound and performance. Many 'upgrades' dictate gold-plated hardware, fancy inlays and colours. Not here. The rejuvenated pickups and the associated Greasebucket tone controls breathe more modern life into this guitar, giving what would have already been an extensive tonal pallet even more colours to play with. Little construction concerns aside, the big frets, thin nitro finish and no-nonsense approach make this guitar extremely alluring.